DIDO is a ready-to-use CPU module family based on Texas Instruments DM814x (DaVinci) and AM387x (Sitara) Cortex-A8 high performance application processors. DIDO is the first product of DAVE Embedded Systems Ultra Line, which includes best-in-class solutions and full featured SOMs. DIDO shares the same DM814x processor with Maya (Lite Line) and Naon (Esatta Line) and is built with the same connectors format (ZFF) as Naon and Lizard (Esatta Line). Dido is a family of system-on-modules that belongs to DAVE Embedded Systems Ultra Line product class. 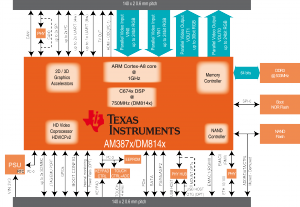 It is based on Texas Instruments DaVinci digital media processor DM814x. Dido Hardware Manual provides detailed information about hardware interfaces and characteristics. This document will provide a functional overview of the module and will focus on system-related issues. Please visit Dido Web Page for more product information. For detailed information about the Linux BSP and the evaluation kit of DIDO SoM, NAON SoM and MAYA SoM, please refer to the DELK/NELK page. Please subscribe to the Dido Pages Updates RSS Feed using your favourite RSS reader to be notified on wiki pages updates related to Naon. This category collects all the pages specific to Dido modules and related carrier boards. This page was last modified on 11 November 2016, at 08:55.